I have published a Western States Legal Foundation Commentary, Ukraine: Time to Step Back from the Brink, available at the link below. Ukraine: Time to Step Back from the Brink, Western States Legal Foundation Commentary, February 2015. I gave a talk at the Global Network on Weapons and Nuclear Power in Space annual meeting last weekend. Several people asked for a text, so I am posting the talk here (see link below). The talk touches upon current U.S. strategic weapons modernization programs, military space, and their relevance to the current climate of growing great power competition and confrontation, including the crisis in the Ukraine. 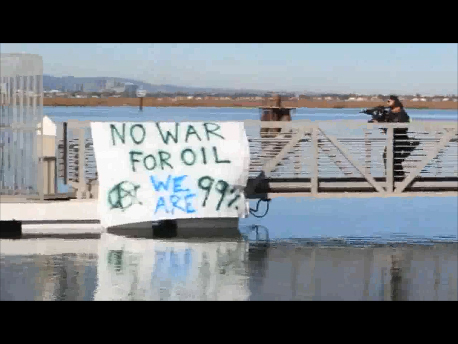 Frame from video, Urban Shield 2012 Highlights, listed on Youtube as sponsored by the Alameda County Sheriff’s Office. Urban Shield, a huge multi-agency emergency response drill, will be held at sites throughout the Bay Area from October 25-28, 2013. Although often presented to the public as useful for preparing the region to respond for everything from earthquakes and fires to school shootings, Urban Shield primarily is focused on preventing and responding to terrorist attacks. Urban Shield also features a trade show with vendors promoting products ranging from high powered weapons and surveillance equipment to protective gear for hazardous materials response teams. The trade show will take place at the Marriott, in downtown Oakland. The exercise also is a competition, with SWAT teams, hazmat teams, EMT’s and firefighters not only from the Bay Area but from around the world competing for top honors. A coalition of groups centered in the East Bay is protesting Urban Shield. The law enforcement aspects of the exercise are emblematic of the militarization of policing that took root in the “war on drugs” and has accelerated and intensified in a post 9/11 era. Further, a trade show in downtown Oakland featuring guns and ammunition undercuts long-running efforts to stop the marketing of guns and ammunition, part of broader efforts to stem the tide of gun violence in the city through non-violent means rather than violent repression. Urban Shield sometimes is portrayed as a general emergency response exercise, but its primary focus is anti-terrorism. There’s a consortium of agencies called the Bay Area Urban Area Security Initiative (UASI) that administers Urban Shield. At recent public hearings on Urban Shield, Oakland city officials tried to give the impression that the city’s involvement was limited to hosting the firefighting elements of the exercise, even suggesting that Alameda County, not Oakland, was the proper agency for questions or criticism concerning Urban Shield. All major Bay Area jurisdictions, however, participate in UASI governance: the UASI “Approval Authority” includes “representation from each of the three major cities of Oakland, San Francisco, and San Jose and the County of Alameda, County of Contra Costa, County of Marin, County of Monterey, County of San Francisco, County of San Mateo, County of Santa Clara and County of Sonoma.” (Bay Area Urban Area Security Initiative, The Bay Area Homeland Security Strategy 2012–2014, January 2012, p.5). The trade show to be held at the downtown Oakland Marriott is more than just a side show. Exhibitors showcase an array of equipment including guns and ammunition, surveillance devices, software to organize the vast flows of information gathered by police agencies, and gear used by bomb squads, paramedics, and fire departments. 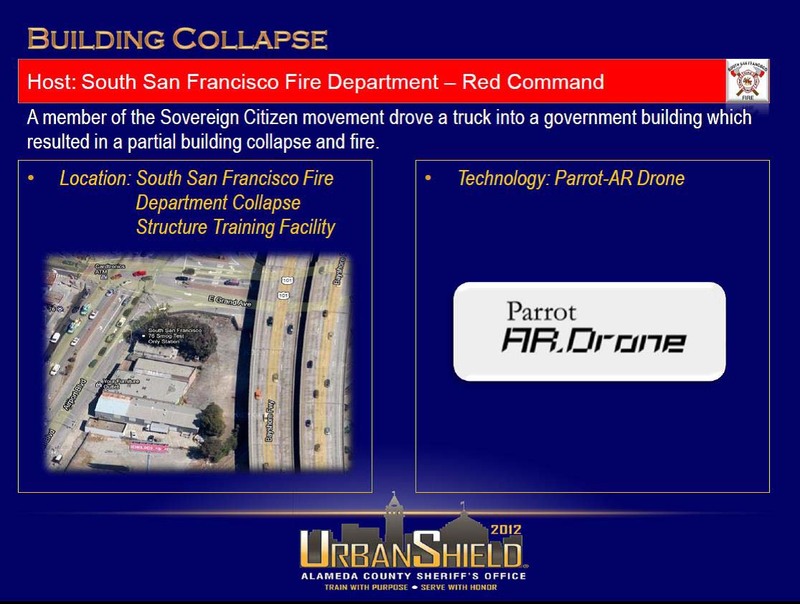 Slide from Bay Area UASI Approval Authority Urban Shield 2012 Presentation, December 2012. All of this–the acceptance by local officials, even in a supposedly “liberal” region like the Bay Area, of funding tightly tied to an increasingly militarized internal security apparatus, the incorporation of corporate marketing directly into government activities–might have seemed shocking to many a decade or two ago. The “new normal,” however, is a surveillance-internal-security state driven by an intelligence-police-prison-industrial complex, a new Homeland Security wing of the military industrial complex. As I wrote six years ago regarding Bush-era domestic spying, the Cold War arms race was fueled in large part by power and profit interests having little to do with the common good, exploiting the climate of fear and to sell an endless and ever more sophisticated and expensive array of military technologies and services to the State. But for the emerging police-surveillance-industrial complex, our civil liberties will not be mere collateral damage in larger campaigns selling weapons and wars. They will be squarely in the sights of those who seek to sustain an increasingly two-tier society and to increase their profits by diminishing the freedoms of the rest of us. The “war on terror” has led to a climate of fear and inflated threats. It has encouraged those in government to view the population as either victims or enemies. Training develops attitudes as well as exercising skills. The “homeland security” approach typified by Urban Shield emphasizes technology heavy, military-style rapid response. We are far better served by seeking solutions that strengthen our everyday public services and the economic and social health of our communities–the strongest basis for mutual aid and recovery in times of disaster. It’s time to end the war at home. Western States Legal Foundation has published an Information Brief on the international law implications of the current Syria crisis, written by Andrew Lichterman, with contributions from Jacqueline Cabasso and John Burroughs. The Information Brief, titled The Rush to Bomb Syria: Undermining International Law and Risking Wider War, concludes there is no legal basis for unilateral attacks on Syria by the United States or other powers, and that there are legal and diplomatic alternatives to military action. Some excerpts from the introduction and conclusion can be found below, for the complete piece click on the link above. Once again, the President of the United States is leading a rush towards war without regard for the United Nations Charter and the international legal regime intended to control prohibited weapons and to respond to threats to peace and security. Even before United Nations inspectors were on the ground in Syria to determine whether a chemical weapons attack had occurred, the U.S. and its allies began moving ships into attack position in a manner that, in the context of public statements by the leaders of the United States, France, and the United Kingdom, constituted an undeniable military threat to Syria. Since World War I, use of chemical weapons has been viewed almost universally as monstrous, and as a violation of treaty-based and customary standards of international humanitarian law. If they were used in Syria by any party, that action should be condemned, and all states should cooperate in identifying the perpetrators and in pursuing their apprehension and prosecution by all legal means. There is no provision of international law, however, that allows ad hoc coalitions of countries to determine for themselves who they believe the guilty parties to be, and to punish them by acts of war against the territory of a sovereign state. The United Nations Charter allows unilateral military action only where a country is under attack or imminent threat of attack. None of the countries proposing the use of force against Syria can make any claim that Syria has attacked them, or that they are under imminent threat of attack. International treaties outlawing chemical weapons and prohibiting their use provide no special exception for such ad hoc use of military force. To the contrary, the Chemical Weapons Convention, the most comprehensive instrument concerning chemical weapons, provides for investigation of alleged violations by specialist bodies constituted by the Convention and recourse to the United Nations to authorize any use of force. In this instance, it is especially important that transparent, credible procedures be followed for investigation of the allegations of chemical weapons use and a determination of the responsible party or parties, as well as for actions to prevent further use and to punish those culpable. The airwaves are full of pundits and politicians saying that both the chemicals weapons use and the broader crisis in Syria present no good choices. But it is hard to see how breaking solemn undertakings to most of the countries in the world by neglecting treaties and principles of international law that the United States has agreed to will either bolster U.S. “credibility” or enhance respect for international law. President Obama says he is ready to make the “hard choices.” But giving in to the powerful, omnipresent American war caucus once more by sending cruise missiles against a country that cannot respond in kind is neither a hard choice for an American president nor a good one. It is a course of action that will take many lives with little promise of saving others, and that will once again lead us all down a dangerous road with no visible end. For American elected officials, saying no to the easy, violent options offered by a national security and military industrial complex too long ascendant would be the hard choice, the courageous choice, and the right choice. On August 27, the Oakland Police Department issued a community notice to make the public and media aware of an aerial survey that would be taking place over portions of San Francisco, Pacifica and Oakland through September 1, ostensibly to measure “naturally-occurring background radiation.” According to the notice, the flyovers are part of a joint research project between the Department of Homeland Security’s Domestic Nuclear Detection Office (DNDO) and the National Nuclear Security Administration. The only explanation offered: “The background data will be used by DNDO and NNSA to improve aerial radiation measurement capabilities used by local, state and federal entities.” The Oakland Police notice refers its readers to the DNDO and NNSA Public Affairs offices for additional information. 1) What is the significance of the timing of this data collection? 2) What criteria was used in selecting the areas for the flyovers? 3) What will the data be used for? 4) Will a report on the findings be released to the public? If so, when? 5) Are additional flyovers planned for the future? Is so, when and where? Back in 2006, I wrote a series of posts about the “Divine Strake” test, a very large conventional high explosive test slated to be conducted at the Nevada Test Site (now dubbed/sanitized to the “Nevada Nuclear Security Site”), intended to simulate the effects of low-yield nuclear weapons. That test was later canceled as a result of opposition both from disarmament groups and from regional opponents concerned about potential environmental effects. Along the way, I found budget documents showing that the U.S. military also was developing a very large, earth penetrating conventional bomb called the Massive Ordnance Penetrator. (see the latter part of my post titled The ‘Divine Strake’ low-yield nuclear weapons simulation: government denials and responses). “One weapon Tegnelia commented on is the HTD program’s Massive Ordnance Penetrator, a multi-ton bomb. He stressed that it’s a defensive, not offensive, weapon. He told AFPS that the MOP is a test article meant to understand the design principles on which a country might build a weapon to counter hard targets. ‘We are not in the process to convince anybody to field a large earth penetrator,’ he said.” Steven Donald Smith, “U.S. Agency Works to Reduce WMD Threat,” American Forces Press Service, April 3, 2006 (emphasis added). Analyzed effectiveness of massive ordnance penetration against hard and deeply buried targets and completed preliminary design. Flight tests have been successfully conducted at White Sands Missile Range, New Mexico. MOP integration activities for initial weapon delivery are also complete. Final system refinement, design and test will be complete in 2012 with additional weapon deliveries in 2013. The Air Force is managing and funding the program at this time, with Defense Threat Reduction Agency (DTRA) providing support. All of this illustrates once again that on most matters, there is little reason to believe that any official of the United States Government is telling the truth when speaking for public consumption. The Reaching Critical Will project of the Women’s International League for Peace and Freedom has released a new report on nuclear weapons modernization. The report, titled Assuring Destruction Forever: Nuclear Weapon Modernization Around the World, can be downloaded for free and hard copies are available for $8 from the Reaching Critical Will website. The report explores in-depth the nuclear weapon modernization programs in China, France, India, Israel, Pakistan, Russia, the United Kingdom, and the United States, and analyzes the costs of nuclear weapons in the context of the economic crisis, austerity measures, and rising challenges in meeting human and environmental needs. It features three pieces by DisarmamentActivist.org authors. Andrew Lichterman, senior research analyst for Western States Legal Foundation, wrote the chapter on the United States and a chapter on the role of civil society and social movements in creating the requisite political will for disarmament, and John Burroughs, Executive Director of the Lawyers’ Committee on Nuclear Policy, wrote a chapter on international law and nuclear weapons. The chapters also are available separately as pdf files. Below are the links to chapters written by WSLF staff and board members. There will be a launch event for the report in Vienna, Austria on Thursday May 3, one of a number of NGO events scheduled alongside the Nuclear Nonproliferation Treaty preparatory committee meeting the first two weeks of May. The launch event will be in Room M2 of the Vienna International Center, May 3, 1:15–2:45p.m. Almost nine years after the start of the 2003 Iraq war, are once again seeing U.S. politicians and elected officials targeting an oil-rich nation in the Persian Gulf, claiming that it might soon build nuclear weapons, a claim based on sketchy evidence provided by sources we never see. This time the target is Iran, and the U.S. is once more trying to drag its allies with it on a path that could lead to war. Yet while the U.S. government lectures and threatens Iran and North Korea about the evils of nuclear weapons, it routinely test fires its own long-range nuclear Minuteman missiles from Vandenberg Air Force Base on the central coast of California. Almost 450 Minuteman missiles remain deployed and on alert, part of a U.S. nuclear arsenal still large enough to end civlization in a day. The next Minuteman test launch is scheduled for February 25, 2012. A nonviolent protest is planned at Vandenberg at five minutes to midnight, Friday February 24. Women’s International League for Peace and Freedom (WILPF) has chartered a Green Tortoise bus that will leave for Vandenberg from Oakland at 5 pm, Feb. 24, returning by 7 am the next day, picking up people along the way. If you live in Southern California, please join a protest from 12 noon–1 pm on Feb. 24 at the Los Angeles Air Force Space and Missile Center, 262 N. Douglas Street. Wherever you live, please sign the petition calling on President Obama to cancel the test and start negotiations for the elimination of nuclear weapons. click here to see the petition. 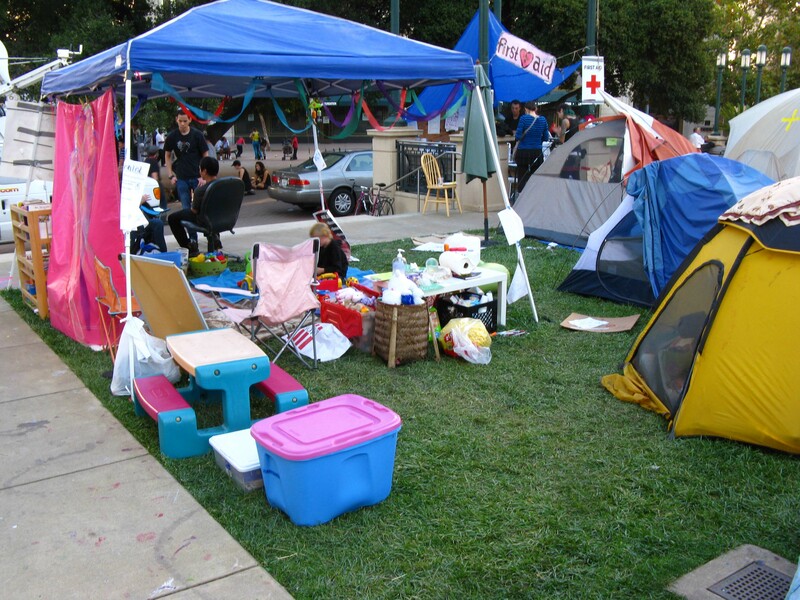 Early Tuesday morning, hundreds of police officers descended on the Occupy Oakland encampment, driving campers from their beds. The police arrested those who stayed, gassing some and shooting others with “non-lethal” projectiles. Their property was confiscated, the small temporary village, with its kitchen and library, medical tent and children’s area, was destroyed. Children’s play zone and medical tent, the kind of threats to public order that required hundreds of heavily armed police to subdue. These are some reflections on the occupations, having spent time at several and followed many others from afar. The occupations share similarities, but also have local characteristics. I can not speak for any or all of them, but as a participant in the debate they have sparked I can speak, and that is the point. This is some of what I have heard, and some of what I want to say. It is not a time to speak with one voice. The conversation is only beginning. The more it grows and the longer it goes on, the more reason for hope. The occupation movement is a response to internal colonization, to a sense that there is no space in our cities and towns and lives that has not been invaded by immense organizations in which we have no voice. In most aspects of our lives we are commanded or exploited, presented with pre-made, limited choices or no choices at all. And even that is only if our existence is either useful or profitable to the huge organizations that control both the necessities of existence and most social space, real and virtual. If we are neither useful as workers nor profitable as consumers, we are thrown away, pushed aside, squeezed out. Soon there will be no place left to go. A popular trope used by the mainstream media and in professional political circles to denigrate the Occupy movement is to express puzzlement about “what those people want,” to say they have no “demands.” Yet the immediate “demands” of these occupations are clear. 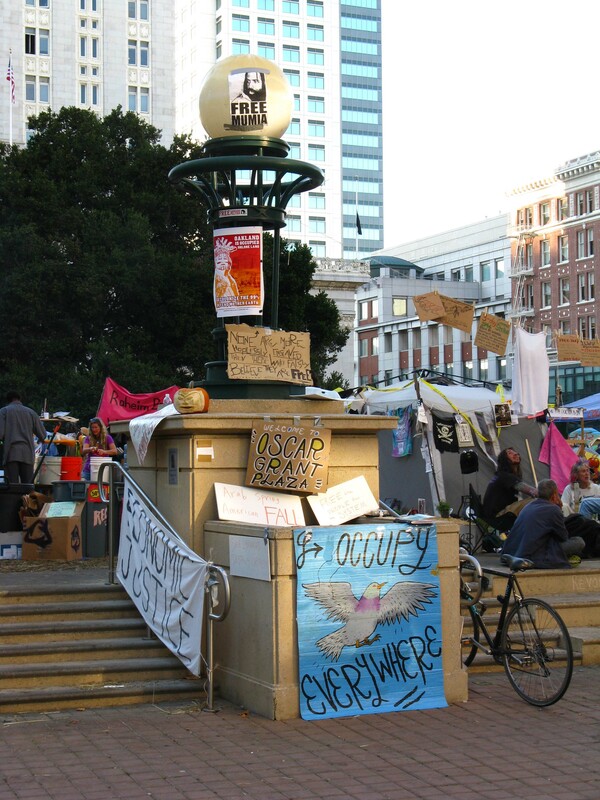 The first is that we have the right to reclaim public spaces (regardless of their legal definition) for their rightful purposes, which are the discussion necessary for the construction of communities that are fair, democratic, and work for all of us, and for the physical activity of constructing such a community. The second demand, equally important, is not really a demand but a call, addressed to all who hear in their capacities as human beings. It is “join us.” It is a call that appeals first to all of us who are politically homeless in the current order of things, who lack the wealth or the position in an increasingly rigid, polarized, and inequitable society to have a voice. The political classes–government officials elected or appointed in or out of uniform, party operatives, NGO professionals, propagandists masquerading as reporters and analysts in the corporate-owned media– can not–will not–hear either the demand or the call. They cannot hear the call because it is not addressed to them as they demand to be addressed– in their status as officers, officials, or professionals. The demand for the moment only says to those who insist on their roles and prerogatives in the machinery of destruction: you have done enough damage. Leave us alone, while we figure out what to do about it. This demand leaves no place for them so long as they remain within their well-paid roles and does not pay homage to their status, so they refuse to hear it.